Today I had one quite incredible experience with a friend’s ASUS notebook, and in particular, the crashed Windows OS on it. On boot, the machine immediately died with a BSOD, showing an error message “A certificate for ______ cannot be verified.” It then offered to either enter the UEFI BIOS or to “call an administrator for help.” As I was their “administrator”, they called me and handed me the notebook, which I was looking with a jaw dropped. No one knew how this happened, no one could give me hints about the reason behind the situation, in which the machine was found. There was one thing, which made the situation even more interesting: machine’s original Windows product key was lost and I was absolutely unsure if during reinstall the machine picks it up from the BIOS or anywhere else, especially because the machine was purchased “naked” and the OS was purchased separately. For some reason, the key was not stuck to the body of the PC. 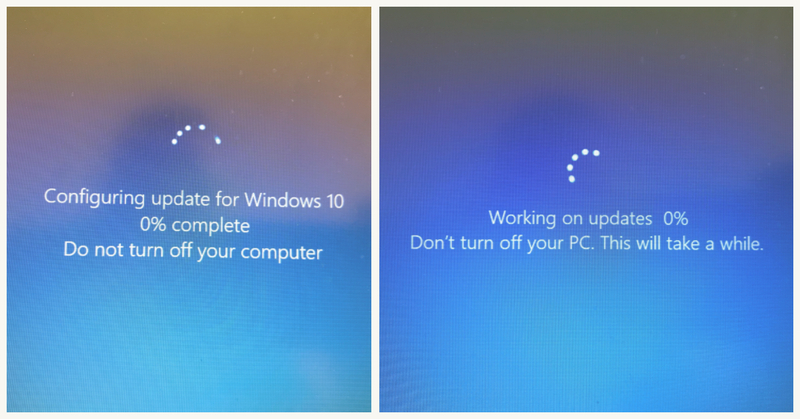 Anyway, I had no other option but to create Windows 10 Installation Media and to hope all would be OK. The machine was dead anyway. After I put the USB key in the machine, I found it does not pick up correctly the bootable USB and it does not offer it to me as a bootable device choice. I was very close to giving up when I found “Manually add boot device”, and somehow succeeded to add the USB key as such. Now it was time to be absolutely surprised! After it booted from the USB, I was expecting Windows installation prompt, but instead, it showed the Windows Update installation progress, at 88%. My jaw dropped. For one thing, now I knew what (of course!) went wrong. This was an obvious case of Windows Update gone wrong. But on the other hand, I was astonished by the fact that it succeeded to continue with the update progress. 88%…95%…100%… and then reboot. The USB key was still there, so it picked up again from it and then continued to Windows Update phase 2, applying the update, which before has gone wrong. Ten or so minutes later (the notebook is not very high end), it loaded the login screen of the installation, which I never believed I will see again: the one, which was on the PC already. I suspected the installation is now fully fixed. But since I was not sure what would happen once the USB is removed, I logged in with one primary task: to extract the official product key of the setup for further use. The machine seemed to be in perfect health, so I proceeded to the task. My first try was with (this video). Unfortunately, the method described there showed nothing: just empty contents, like there’s no product key there. The second try was with Belarc Advisor, as described by the second video in my query. This program succeeded to pull out the information I needed, I had now the precious Windows Product Key. The second step was to reboot and remove the USB. Once I did that my expectations were it would pick up without a problem the (already fixed by the finalized update process) original installation. My expectation was correct. I rebooted the machine, removed the USB key, and it booted correctly. I do not know if the Windows Update process was forcefully interrupted, which caused the malfunction of the boot process. But I’m very pleasantly surprised by how robust Windows Recovery process is nowadays. I even did not ask for myself to enter recovery, the USB boot process automatically discovered that the Windows, which is installed on the HDD, is in-between updates, and finalized these. Not sure if this is a “by design” functionality, or somehow I triggered it, but the fact it sparred the installation and probably a new Windows license purchase was quite nice. My task with this setup now is to put it to the latest Windows April 2018 update. A much easier task, compared to what I originally expected! This entry was posted in Daily, English, Hacking, microsoft and tagged how-to, installation, product key, recovery, success, update, windows by Doncho. Bookmark the permalink.